Tithing is a worthy principle of sacrifice and humility, intended for the maintenance of the Church. Tithe means “one tenth,” stemming from the Law of Moses which required a tenth of first fruits, or the “increase.” The tithing doctrine of the LDS Church has evolved as needed over the years, becoming a literal prosperity gospel; a transactional relationship with God. General Authorities regularly promote the explicit notion that if you first pay The Corporation of The First Presidency, God will provide for the rest. While the Book of Mormon promotes a literal prosperity gospel, coincidentally linked directly to 19th century manifest destiny ideals, there is no biblical support for financial prosperity-tithing doctrine. In stark contrast, Utah is the affinity fraud capital of the U.S. and boasts one of the highest personal bankruptcy rates. As members become full tithe payers, they honestly believe that their generous monetary donations are bettering the world. Many are proud of the idea of Church being one of the largest charitable organizations in the world. Yet, few realize how exceptionally few LDS dollars alleviate human suffering or need, that the Church spends more every year on the BYU football program than on humanitarian causes, or how the Church counts member donated hours of service. Few members recognize that the Church altered key words in the original Lorenzo Snow revelation, which gives the official guidelines for tithing collection, to achieve the all-encompassing tithing definition of today. The promotional film – Windows of Heaven – that many LDS members saw when they were children, was just another faith inspiring myth. While constructing a multi-billion dollar shopping mall and office tower adjacent to its corporate headquarters, the Church expressly declared the interest earned from its real estate holdings to be of “non tithing” origin, despite the fact that every cent the Church has ever received originated from tithing or member donations, frequently at great personal sacrifice. The mall development costs are estimated to have exceeded two decades of the Church’s charitable programs. Hard financial data remains unavailable, as the Church does not provide financial transparency, even to donating members. Now that the Church’s doctrinal skeletons are out of the closet, with the Brethren suggesting they never hid them, the balance sheet remains the most closely guarded secret of the Church. Malachi 3:8-10 asks, “Will a man rob God?…prove me now herewith…if I will not open you the windows of heaven, and pour you out a blessing, that there shall not be room enough to receive it.” Malachi is frequently quoted by Mormons to cite the historical precedent originating in the old testament requiring members to pay the Church 10% of their income. 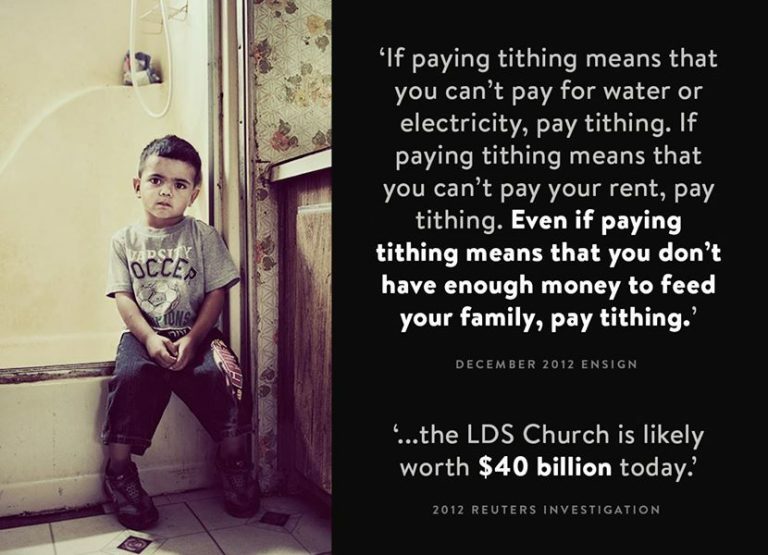 However, the scripture is misused, and taken out of context in the LDS narrative, as Malachi directs this charge at the priests who were stealing tithes – not the tithe payers. Those who preach tithing from Malachi ignore the proper context, as it is clearly addressed to old covenant Israel and not to the Church. (Malachi 1:1) Malachi further reminds readers of the true context of the law, “Remember the law of Moses my servant, which I commanded unto him in Horeb for all Israel, with the statutes and judgments” (Malachi 4:4, also Neh. 10:28-29). The widow’s mite is another parable often misunderstood by Mormons to suggest that everyone should pay 10%. In fact, the context of the scripture confirms that Jesus was rebuking those making a public display of tithing, whereas the poor widow was actually sacrificing. The moral of the story is not to have everyone pay the church. In an 1899 Conference talk, President Lorenzo Snow said “…I plead with you in the name of the Lord, and I pray that every man, woman and child who has means shall pay one tenth of their income as a tithing…” The Church later altered Snow’s revelation, removing the essential words “who has the means,” commanding all to pay, even those who struggle to provide basic food, utilities and health to their families. The Church’s belief in a transactional, material prosperity underpins this doctrine. The Apostle Orson Hyde wrote, “If it requires all man can earn to support himself and his family, he is not tithed at all. The celestial law does not take the mother’s and children’s bread, neither ought else which they really need for their comfort. The poor that have not of this world’s good to spare, but serve and honor God according to the best of their abilities in every other way, shall have a celestial crown in the Eternal Kingdom of our Father” (The Millenial Star, 184). The original definition and spiritual nature of tithing does not correlate with the transactional gospel preached by the LDS Church today. LDS scripture instructs that members can become “exceedingly rich” in material possessions through the blessings of the Church. In the book of Alma, we read “And now, because of the steadiness of the church they began to be exceedingly rich, having abundance of all things whatsoever they stood in need – an abundance of flocks and herds, and fatlings of every kind, and also abundance of grain, and of gold, and of silver, and of precious things, and abundance of silk and fine-twined linen, and all manner of good homely cloth” (Alma 1:29). As conversion rates decline in the developed world, the Church is refocusing its growth efforts on emerging economies. President Nelson, only the second LDS Prophet to ever visit Kenya, revealed, “We preach tithing to the poor people of the world because the poor people of the world have had cycles of poverty, generation after generation. That same poverty continues from one generation to another, until people pay their tithing.” At the time of his advice, Kenya’s average per capita income was approximately $1,500, with millions lacking access to safe drinking water, basic healthcare or education. While addressing Zimbabwe Saints, Wendy clarified the transactional nature of LDS tithing doctrine by sharing how George Q. Cannon put as much money as possible into tithing when he was very poor. She expounded on the notion of tithing seeding, as George believed he was “…not paying on what I make, I’m paying on what I want to make.” The transaction apparently worked, as “the very next year, George made exactly what he had paid tithing on the year before” (Deseret News, April 16, 2018 / Zimbabwe conference address). Most Christian churches go to Africa to help build schools and sanitary facilities, teach English or give back in some lasting manner, while the LDS Church goes to ask for money. 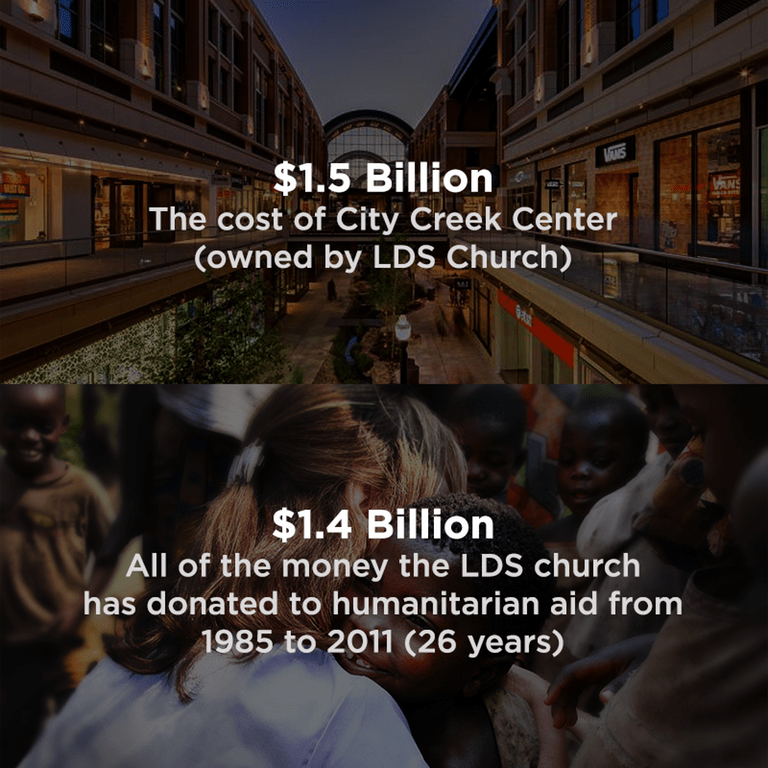 While most churches understandably seek charitable donations and the acquisition of sufficient assets to meet their needs, the LDS Church takes religious capitalism to an entirely different level. Members originally had a voice in finances by providing common consent in executive actions. The Church provided some financial transparency until late 1950s, before First Counselor Henry D. Moyle drove the Church $8 million into debt. The Church then decided it best to cease financial reporting. Moyle founded the Property Reserve, a for-profit real estate investment division, using member donated funds. The entity today builds shopping malls and office towers. Today, increased scrutiny is being placed on the Church’s massive stock market and real estate holdings. While hampered by its refusal to elaborate on its use of member funds, and use of numerous shell corporations, new details about the Church’s business dealings are emerging. According to documents obtained by MormonLeaks in 2018, it appears that the Church holds at least $32,000,000,000 (32 billion) in various distributed stock investment accounts, not including assets such as bonds, real estate and active businesses. Total corporate holdings could well exceed $100 billion – including 2% of Florida’s landmass. Regarding the Church’s charitable efforts, he confirms, “As a percentage of their assets, they do hardly anything…. The Church’s contributions to caring for the poor, locally and even internationally, mostly consist of time by members who are volunteers” (A Thoughtful Faith podcast #267 – LDS Church and Affinity Fraud: Mark Pugsley, Nov 4, 2018). In November 2018, the LDS Church announced the construction of a 28-story luxury high rise adjacent to its current shopping mall and office tower complex at 111 Main, whose list of tenants include Goldman Sachs. Contrary to what most members believe, the LDS Church spends an estimated 1% of its annual revenue on charitable activities, while the bulk is consumed by the operation of chapels, temples, salaries and an expanding real estate empire. LDS Charities highlights the volunteer labor aspect of its congregations around the world, while not providing an audit opinion or transparency about how donated funds are actually spent. The Church tracks volunteer hours at the ward level, which are reported quarterly to Salt Lake City. Such tracking and aggregating of hours is a strong indication that individually volunteered community service efforts are included in LDS Charities’ results. It is important to understand how the sum of “assistance” in no way equates to cash expenditures. 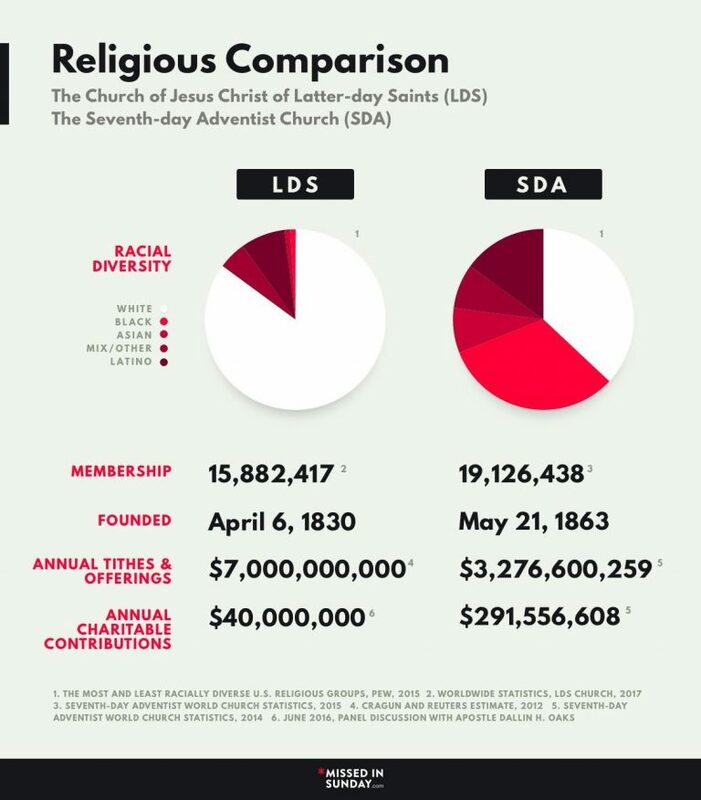 By comparison, the Seventh Day Adventists deliver many times the reported LDS amount via its globally diverse membership, while providing full transparency. Even Billy Graham’s much smaller Samaritan’s Purse charity delivers hundreds of millions in aid with full transparency. The United Methodist Committee on Relief backs up its assistance claims with audited financials and spending projections. Given the Church’s extraordinary wealth and tight purse strings, please consider alternate LDS donation channels, such as Liahona Children. “On occasion, Church Presidents have personally benefited from Church finances by simply cancelling their indebtedness to the Church. On 23 April 1834, a revelation ended the Kirtland United Order and distributed its real estate assets among Joseph Smith, Oliver Cowdery, Sidney Rigdon, Frederick G . Williams. ….The next two Church presidents did likewise. In August 1877, three weeks before he died, Brigham Young obtained a cancellation of his debts in Ogden, Utah, extending back to 1849 . In~ 1879, John Taylor, as president of Zion’s Savings Bank and Trust, had the Vice-President of the bank destroy two notes for $50,000 of Taylor’s personal indebtedness to the bank” (LDS Church Finances, Sunstone, June 1996). 1836 – Bishop Edward Partridge defines tithing as 2% of each member’s net worth after deducting debts. This was to cover operating expenses of the Church. May 12, 1838 – Joseph Smith and Sidney Rigdon negotiated an annual salary of $1,100 each, which was over 3 times the wage of an average worker. The move raised such a fuss that a week later the High Council rescinded the deal and instead granted the men 80 acres of land. July 8, 1838 – D&C 119 revelation delivered, commands member donations, redefines tithing as paying “one-tenth of all their interest annually” and any “surplus property” as a “standing law unto them forever.” The purpose of which was “for the building of mine house, and for the laying of the foundation of Zion and for the priesthood, and for the debts of the Presidency of my Church.” Notice there is nothing about humanitarian efforts or caring for the poor. Charity was, and is, something separate from tithing. 1844 – Less than a month after Joseph’s death, the Quorum of the Twelve Apostles issued an official proclamation to immediately pay “a tenth of all their property and money…and then let them continue to pay a tenth of their income from that time forth.” There was no exemption for those who had already paid one-tenth of their property upon conversion. 1845 – The Quorum of the Twelve reemphasized “the duty of all saints to tithe themselves one-tenth of all they possess when they enter into the new and everlasting covenant: and then one-tenth of their interest, or income, yearly afterwards.” Interestingly, two weeks after this proclamation they exempted themselves from any tithing obligation. 1851 – In a special conference, President Brigham Young voted to accept excommunication as a punishment for non-payment of tithing. This was loosely enforced. 1873 – Orson Hyde described tithing as paying one tenth of one’s property at baptism and then one tenth of one’s annual income thereafter. 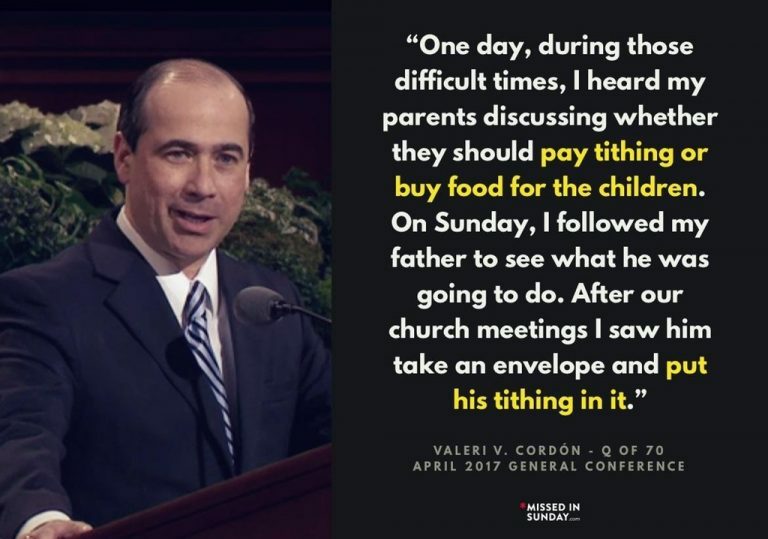 This is the first instance of tithing being described as based on ones income rather than on their surplus or interest. 1880 – John Taylor declares a Jubilee Year in which he forgives half the delinquent tithing debt. 1896 – Salaries are stopped for everyone but The 12 because of financial troubles. 1899 – In response to massive Church debt, President Lorenzo Snow limited the law of tithing to one-tenth of annual income, removing the required payment upon conversion. This, plus added reemphasis, prompted a dramatic increase in tithe payers. 1900 – Lorenzo Snow commissioned a list of non-tithe payers in the church, which numbered 10,000, including Apostle John Taylor (the Apostle exemption had expired at this point). 1907 – The Church paid off its debts. 1910 – The payment of tithing became a requirement to receiving a temple recommend. 1914 – The Church releases its first official report on the use of tithing funds. 1959 – The Church terminates financial disclosure. 1970 – Joseph Fielding Smith sends a letter defining ‘interest’ as ‘income’ to all Bishops, Stake and Mission Presidents. 2016 – The Church admits to spending only $40 million on “welfare, humanitarian and other…projects” annually. The Church conveniently counts member donated hours of service in their charitable calculations, further diminishing already tiny charitable claims. Stated directly, the mall cost more than 3 or 4 decades of actual humanitarian aid. By comparison, Seventh Day Adventists donate on average $215 million annually, 1/3 of tithing received, while operating prominent hospitals and universities. Utah is the nation’s capital for affinity schemes. U.S. Attorney John Huber recently stated, “Utah is out of whack in the proportion of white-collar fraud that we have compared to other states. And that’s recognized throughout the country.” Myriad essential oils, vitamins, network marketing and ponzi schemes prey on a community that’s been groomed since youth to favor feelings and community over reason. A 2012 article in The Economist reports that Utah is believed to have the highest per-capita rate of affinity fraud in the U.S., due to about two-thirds of the state’s residents being members of the LDS Church, among which such crimes tend to flourish. Authorities estimate affinity fraud cost Utahans an estimated $1.4 billion in 2010 alone, an average of about $500 per resident. Q: Why is the LDS Church building shopping malls and office towers? Q: Why won’t the Church provide members with transparency of its finance and operations? Q: Why does the Church’s charitable operations appear to be so small in relation to the Church’s massive income and net worth? Q: Why does the Church count individual members’ charitable hours – cleaning city parks, volunteer hours, etc. – in their corporate entity calculations? Q: Why are members asked to sacrifice precious Saturday family time cleaning chapels while the Church affords multi-billion real estate projects? Q: Is Prosperity Gospel false – are not God’s blessings spiritual? Does this notion stem from Book of Mormon promises to prosper in our white, blessed land, because we’re God’s chosen people? Kirtland Timeline, Mithryn – Kirtland Safety Society, Bank of Monroe, Temple Dedication, Consecration, and related historical events. Beneficial Life, owned and managed by the church, was bailed out to the tune of about $600 Million dollars, using church funds.